The story of King Arthur and the Round Table became a national myth thanks to Geoffrey of Monmouth's Historia Regum Brittaniae – the History of the Kings of Britain. New research has unveiled that this work was written in Oxford. Helen Fulton, professor of medieval literature at York University has found evidence that Geoffrey was in the English city from between 1129 and 1151, the period when he wrote the legendary account. She tells The Oxford Times, "Geoffrey can certainly be traced to Oxford between 1129 and 1151 because his name appears as a witness on a number of charters – grants of land normally awarded by the king to a particular priory. Sarah Peverley, senior lecturer at the University of Liverpool, added “Scholars were already aware that Geoffrey spent a great deal of time at Oxford, studying and teaching there, but the new attention given to documentary evidence linking him to the city is fantastic; it will help us to re-evaluate his social milieu and the cultural influences at work on him as he was composing the Historia. “Though the British fascination with Arthur dates back much further than Geoffrey’s Latin chronicle, Geoffrey is ultimately responsible for the enduring popularity of King Arthur’s story today. He took stories of Arthur’s deeds and achievements from oral culture and brief references to him in earlier works, such as the Historia Brittonum, and invented a golden Arthurian age in the British past. “His narrative presents history as it should have been, not as it really was. 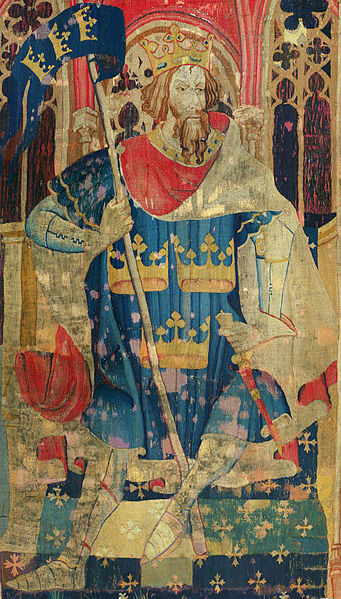 The chronicle’s influence was far-reaching in the Middle Ages, and the Arthurian tales that Geoffrey inspired went onto influence Arthuriana in every subsequent age. “King Arthur’s appeal is timeless because he’s a touchstone for greatness: he answers society’s desire for strong and just leadership." 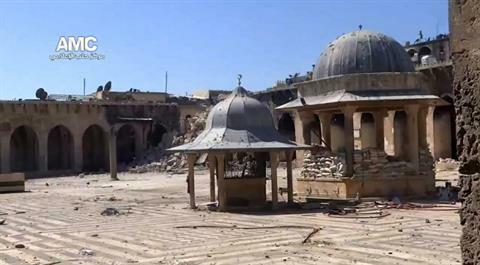 The minaret of Aleppo's historic Umayyad mosque has been destroyed, with video showing the famous structure in ruins. The Syrian government and opposition forces are blaming each other for the destruction. In a video released by opposition forces, one man claims that "tanks began firing in the direction of the minaret until it was destroyed." The minaret was originally built in the eighth century, and rebuilt in the 13th century. The Umayyad mosque has been the scene of heavy fighting between Syrian government soldiers and opposition fighters over recent months, which has left the mosque damaged and looted. They bill themselves as 'America's Finest News Source' and after seeing the competition, its hard to disagree. 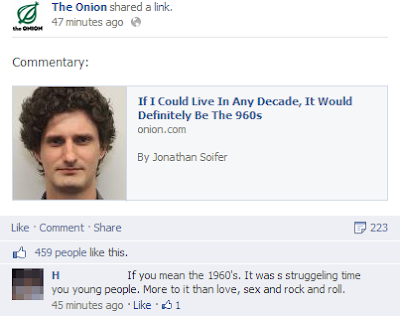 The Onion is well worth reading, as is the site Literally Unbelievable, which shares peoples reactions to their stories. 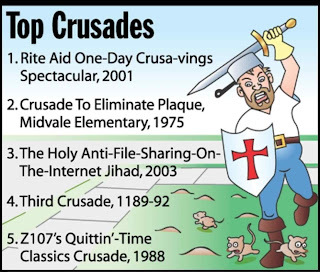 Jonathan Soifer is nostalgic for the time of Edgar the Peaceful, Reginold of Eichstätt and Heriger of Lobbes! At least when the Byzantines and Bulgarians weren't fighting each other. The best lines: "God, what I wouldn’t give to have been a vassal. Or even a peasant. Wouldn’t matter—everyone was cool back then. Primogeniture wasn’t even the law of the land yet, so a king’s death just signaled a free-for-all among his family and neighboring lords." Lyle Hume thinks he "would've turned more than a few wenches' heads back in 1350." Judging by his picture I think he would he is being overly optimistic. The best lines "Of course, at 27, I would've been getting on in years, but I don't think the maidens would have held it against me. They might have been greatly attracted to someone roughly their fathers' age who had managed to hold onto most of his teeth and remain leprosy-free. Plus, I have gout. The disease of kings!" This article, from 1997, was eerily accurate! Best line: "Byzantine Emperor Constantine XI could not be reached for comment." I guess we were all so concerned about the Byzantine Empire that we did not see this other major geo-political event. 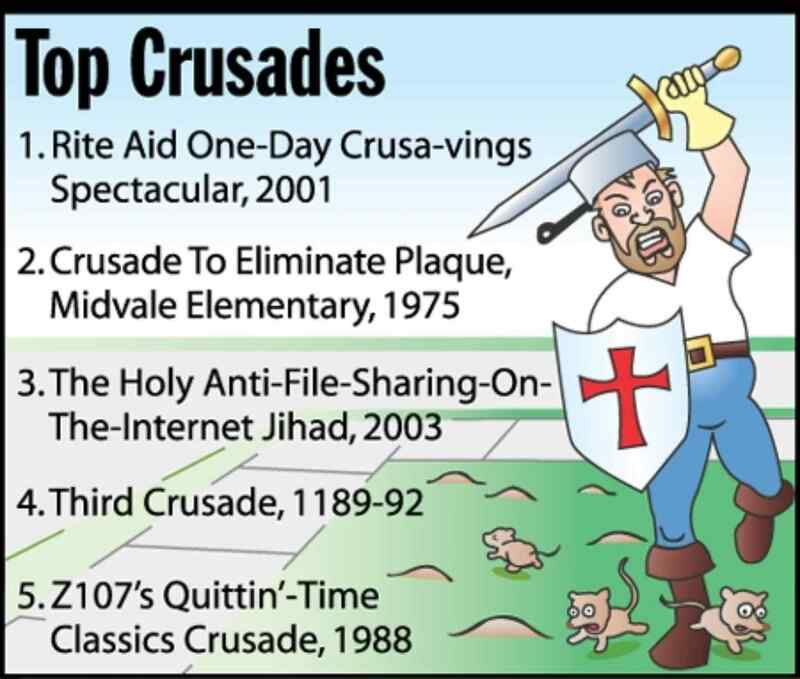 Best line: "I can't believe how easy it was to claim Kiev for the Kingdom Of Ealdormere," said Royal Peer Gawain Falconsfyre, a 44-year-old tech-support assistant from a suburb of Toronto. "It was a piece of cake. Haven't any of these Russians ever heard of a moving-shield-wall offense?" 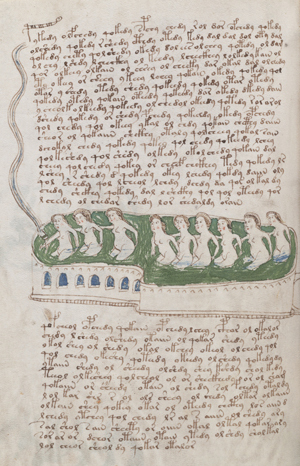 The Voynich Manuscript has confounded scholars ever since it was revealed by a book dealer named Wilfrid Voynich in the early part of the 20th century. 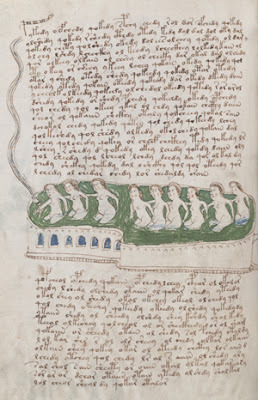 There have been several theories of when this odd manuscript, which contains bizarre images and indecipherable writing, was created, with some believing it dates back to the Middle Ages. In his article Cracking the Voynich Code, Batya Ungar-Sargon takes a look at the history of the manuscript. Radiocarbon dating finds that the manuscript was made between 1404 and 1438, although we do not know when the ink was written on it. Still, some believe the manuscript is really just a hoax, perhaps created in the 17th or even the 20th century. You can read the article on Tablet Magazine. However, she also warns that the her country needs to do a better job protecting archaeological sites from environmental degradation. Click here to read this article from Iceland Review Online. Meanwhile, Chinese archaeologists report that they might have discovered the tomb of Emperor Yang Guang, who was the last ruler of the Sui Dynasty. The small tomb contains a gravestone that identifies the emperor and relates events about the year he died, 618. However, Shu Jiaping, head of Yangzhou's Institute of Archaeology, warns "we're still not sure whether it was the emperor's final resting place, as historical records said his tomb had been relocated several times." Emperor Yang Shang had a very active rule, ordering major building projects including a Grand Canal and rebuilding large parts of the Great Wall. But his construction work and military campaigns bankrupted the state, eventually leading to a coup in which he was murdered. Click here to read the full article from the China Daily. 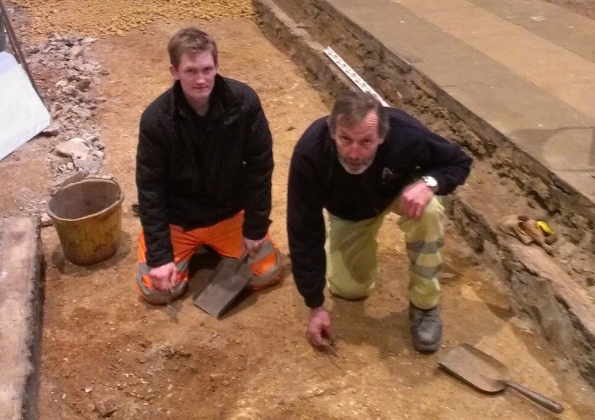 Archaeological work being done at St.Hilda's Church in Hartlepool has turned up an Anglo-Saxon grave. Other burials from the Early Modern period were also found, as the church is digging up a section of its floor to install a new heating system. The discovery might be evidence that an Anglo-Saxon monastery existed on this site. Bede records that a nun named Heiu founded a monastery in the area named Heruteu in the 640s. Dr Steve Sherlock, of Tees Archaeology, said: “It’s an exciting thing. We hope to do more work to understand it. It’s always presumed that there was a church here in Norman times in 1066. 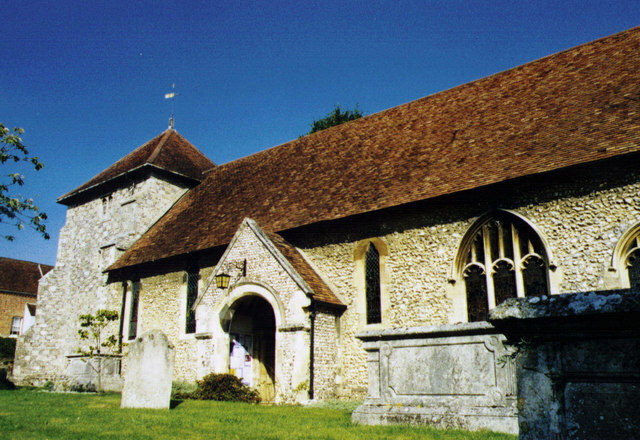 We note that the church is sited in the area of St Hilda’s Anglo-Saxon monastery, about 60ft north of the present church. 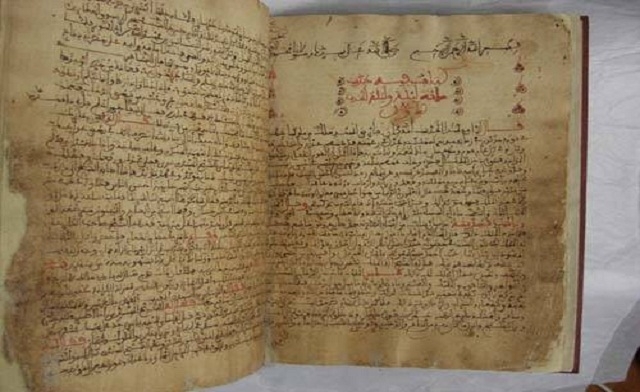 A historian in Germany has come across a new collection of medieval Arabic stories - a kind of precursor to the famous book known as One Thousand and One Nights. 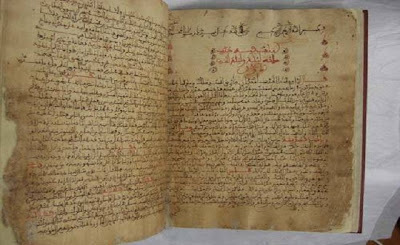 Claudia Ott, a professor at the University of Erlangen-Nuremberg, discovered The Book with the Story of the 101 Nights in a 13th century Andalusia manuscript. The 101 Nights contains 17 stories, two of which can also be found in the 1001 Nights, with most set in India. Ott adds, “It is certainly not by chance that this backdrop has something Oriental about it when seen from an Arabic perspective. It is an image of an Orient that is far away, unfamiliar and exotic — for this reason, particularly attractive." Ott first saw the manuscript on display at a museum in Berlin, and when she had the chance to look at, soon discovered its importance. She has translated the work into German. What to do if you have 10,000 hours of free time? 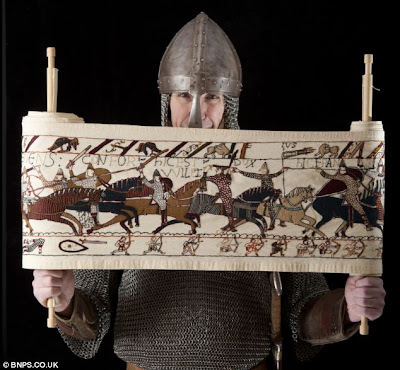 Andy Wilkinson has recreated a miniature version of the Bayeux Tapestry - the eleventh-century embroidery that depicts William the Conqueror's invasion of England and victory at the Battle of Hastings. It took him 18 years to sew the 40 foot-long replica and he estimates that he spent about 10,000 hours to complete it. In an article in the Daily Mail, Mr. Wilkinson explains, "I work a lot of night shifts and used to come home and find myself with not a lot to do for a few hours. 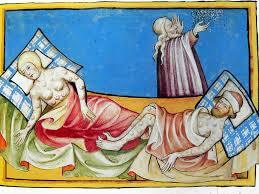 I had seen a copied section of the tapestry at a medieval fair and thought that if they can do that so can I. "Having never done a tapestry before, I came home and found a picture and just started to draw and sew. I had no formal training in sewing or drawing. I just drew the outlines of figures and animals like the horses onto a piece of calico material and then just stitched it." This version of the Bayeux Tapestry depicts the portion of the Battle of Hastings. It will be going on display at Battle Abbey, the site of the battle that was fought in 1066. They also note that the recent find of a possible Black Death cemetery in London might be very helpful in this area of research. For those looking to donate some money to worthy history-related causes, please check out a couple of items on Indiegogo and Kickstarter. Tania Picard-Braun emailed us to let us know about her fundraising drive Help Me Go To Graduate School. She is hoping to raise $1000 to help her go to the University of Manchester where she will study for a Master's degree in Medieval Studies. Tania wrote "I've known I've wanted to be a historian since I was a little kid and that the Middle Ages was my favorite historical period since I was in High School. While still an Undergraduate, I presented my first academic paper at Plymouth St. University's Medieval and Renaissance Forum titled “The Middle Ages in Buffy the Vampire Slayer: Images and Symbols". Meanwhile, at Kickstarter you can find Ian Crowe looking to raise $9000 to create an art book featuring the 100+ stories of Ovid's masterpiece, Metamorphoses. He writes, "The fact is, despite being so pivotal, Metamorphoses is not as widely read as you'd think. Not anymore, anyway. Maybe it's the length of the book that turns people off. Maybe it's the lack of pretty pictures. Either way, I intend to do something about it." Which medieval king will they find next? With the media sensation caused by the recent discovery of Richard III, and the resulting boom in interest at it is not surprising that that some communities are desperate eager to find another lost monarch in their midst. In recent weeks a couple of stories have come out about searches being done in England. At Queen Eliz­abeth School in Faversham, Kent, the building of a school auditorium is allowing archaeologists to explore an area where King Stephen was laid to rest back in 1154. Back in the twelfth-century, this site was home to Faversham Abbey, and the English monarch was buried there along with his wife and son. In the sixteenth-century, this Abbey was destroyed, leaving unknown the whereabouts of Stephen. Meanwhile in Winchester they have already found a body, and are now working to see if they are the remains of the famous Anglo-Saxon ruler Alfred the Great. In March, the skeletal remains discovered in an unmarked grave at the church of St Bartholomew in Wincester were exhumed. Some scholars and archaeologists believe that these might belong to Alfred, who died in 899. Archaeologist Katie Tucker who is leading the search says that while it would be difficult to prove they belong to Anglo-Saxon monarch, "if the bones are from around the 10th century then that is proof they are Alfred and his family, because Hyde Abbey was not built until the 12th Century, and there is no reason for any other bones from the 10th Century to be there." According to The Independent, searches are also underway for both King Arthur (good luck on that one) and Boudicca, who fought the Romans in the first century AD. The enthusiasm for finding lost kings has also spread to Scotland, where local politicians and history-lovers are calling for a search to be made for the grave of King James I, who was murdered on February 21, 1437. Murdo Fraser, the Member of Scottish Parliament for Perth, told The Herald "Leicester will no doubt benefit from the worldwide attention brought by the exhumation of Richard III. A similar project in Perth would have the potential to attract similar global acclaim – which can do no harm in promoting the city. The story behind the assassination of King James I is well known and historians are almost certain that he lies buried underneath Hospital Street in Perth." Finally, it looks like the people at the University of Leicester are not done with looking for kings themselves. Yesterday, they announced the search was on...for Richard IV.